In November 2016, Abhishek founded Foundation Holdings, a global investment firm focused on building companies in the healthcare, education and consumer sectors across India and the Gulf Cooperation Council. His career began as a financial analyst at Bank of America, Merrill Lynch and Lehman Brothers. He then moved to middle-market private equity firm Sun Capital Partners. 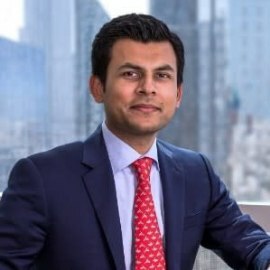 During his nine years in the US, Abhishek advised on M&A and IPOs, with clients including media conglomerate Viacom and the Warner Music Group. He also held senior leadership roles at the UAE’s Ithmar Captial, where his focus was buyout and growth equity investments. Abhishek is a former head of education at Dubai’s Amanat Holding and he was a key player behind Al Noor Hospital Group’s IPO. Another landmark investment was with primary and secondary education provider, Madaares, making Amanat one of Madaares’ five largest shareholders. Abhishek sits on several boards in India and the GCC and is a board member of Spring Air India. He is also a donor and volunteers with Dubai Cares and The Clinton Foundation.